For other people named George Barnes, see George Barnes (disambiguation). George Nicoll Barnes CH PC (2 January 1859 – 21 April 1940) was a Scottish Labour politician and a Leader of the Labour Party. 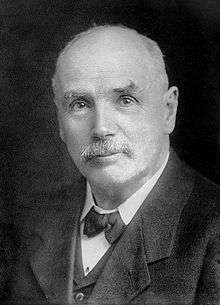 Barnes was born on 2 January 1859 in Lochee, Dundee, the second of five sons of James Barnes, a skilled engineer and mill manager from Yorkshire, and his wife, Catherine Adam Langlands. His brother T. B Barnes was also active in politics, later becoming a Labour Party councillor in Dundee. The family moved back to England and settled at Ponders End in Middlesex, where his father managed a jute mill in which George himself began working at the age of eleven, after attending a church school at Enfield Highway. He then spent two years as an engineering apprentice, first at Powis James of Lambeth then at Parker's foundry, Dundee. After finishing his apprenticeship he worked for two years at the Vickers shipyard in Barrow before returning once again to the London area, where he experienced unemployment during the slump of 1879. He had a number of short-term jobs before settling for eight years at Lucas and Airds in Fulham. During his time in London Barnes became an active member of the Amalgamated Society of Engineers (serving as its General Secretary), a committed member of the co-operative movement, and a keen if moderate socialist, which led him to join the Independent Labour Party on its foundation in 1893. At the 1895 general election he stood unsuccessfully for the Independent Labour Party in Rochdale. He was elected as MP for Glasgow Blackfriars and Hutchesontown at the 1906 general election for the Labour Party, becoming one of the first two Labour MPs to be elected in Scotland. He sat for Blackfriars and Hutchesontown until the constituency was abolished for the 1918 general election, and thereafter sat for Glasgow Gorbals (which covered the same area) until he stood down at the 1922 election. He was Leader of the Labour Party from 14 February 1910 to 6 February 1911. He was Minister of Pensions (1916–1917) and Minister without Portfolio (1917–1920) under David Lloyd George. In 1918 the Labour Party decided to leave the Lloyd George Coalition but Barnes refused to resign. As a result, he was expelled from the Labour Party and with the British Workers League founded the pro-coalition National Democratic and Labour Party, many of whose candidates were elected on the Coalition Coupon. He stood in 1918 under the Coalition Labour title. After resigning as a minister early in 1920 he played no further significant role in British politics. In March 1920 he was appointed a Member of the Order of the Companions of Honour for his ministerial services. He quit politics when the Labour Party announced that it would again field a candidate against him in the general election of 1922. As it was clear that the tide would turn strongly towards the official Labour candidates throughout Glasgow, and as he had no wish to serve in any other party, he decided to withdraw from his seat. Barnes had a long and active retirement, continuing to support the International Labour Organization, serving as chairman of the Co-operative Printing Society, and publishing several books, including his autobiography, From Workshop to War Cabinet (1923), and a History of the International Labour Office (1926). He was a pleasant-looking, mild-mannered man, but little is known about his private life. In 1882 he had married Jessie, daughter of Thomas Langlands, with whom he had two sons and a daughter; his youngest son was killed in action in France while serving as a Second Lieutenant with the Seaforth Highlanders during the First World War. He died in 1940 at his London home, and was buried in Fulham Cemetery. ↑ Kenneth Baxter (2011). "Lily Miller". In Various. Ten Taysiders Forgotten Figures from Dundee, Angus & Perthshire. Dundee: Abertay Historical Society. p. 79. ISBN 978 0 900019 48 7. ↑ The other was Alexander Wilkie who was elected for Dundee at the same election. ↑ "MS 325 Dundee City Labour Party". Archives Services Online Catalogue. University of Dundee. Retrieved 17 January 2012. ↑ "Son of Mr G. N. Barnes, MP, Killed". The Scotsman. 4 October 1915.